Migration may seem like something the birds have trademarked as their own exclusive adaptation to lousy weather and dwindling food supplies. As it turns out, the reasons that birds migrate are just as likely to be concerns for other creatures as well, so lots of other animals migrate, too, with some undertaking equally impressive migration feats. Artic terns travel from their Artic breeding grounds to the Antarctic and back every year. 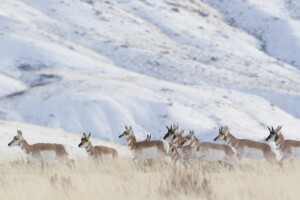 Food generally tops the list of why a species adapts over time to follow a seasonal migration pattern. Whether it’s the disappearance of food, such as insects, or the likelihood of the vegetation they eat frequently being covered with snow in winter, access to food is a pretty darn compelling reason to accept the risks of undertaking a long, difficult journey. Extremes in temperature—in either direction—can also make migration necessary, as can the necessary conditions for mating and raising young. 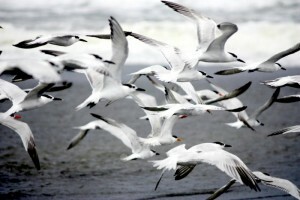 Let’s take a look at some of the mechanisms that enable animals to migrate. We’ll also look at a few migration champs, and some of the hazards migrating animals must deal with on their journeys. Migration – How Do They Do It? Migration is one of the most complex and risky things an animal may need to do to survive, so adaptations to accomplish it with greater success are constantly being fine-tuned. First, an animal must begin getting prepared to go. As their preparations progress, they must be able to sense when to leave. Then, they need to be able to discern which direction to go, how to stay on course, and how best to avoid predators and other hazards along the way. 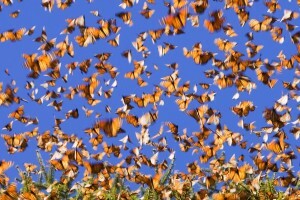 Monarchs migrate from as far north as Canada to their winter home in Mexico. To prepare for their journey, they may need to pack on considerable weight—the bar-tailed godwit, for example, literally doubles its weight in advance of migrating. For signals of when to leave, some species look to the sun’s movement across the sky, others to the pattern of stars surrounding the North Star, polarized light wave patterns, changes in the hours of daylight… even changes in how the air smells. Naturally, they notice diminishing food sources and dropping temperatures, too. Starting off in the right direction and navigating successfully may require consulting the sun, stars, Earth’s magnetic lines of force, or memories of “landscape maps” of rivers, mountain ranges, and coastlines. Depending upon an animal’s means of travel, the time of day they embark on their journey may be important. By flying at night, Neo-Tropical birds avoid predators, while hawks opt to fly by day, because they need to make use of thermals. Tail winds propel birds farther than they could otherwise fly, so, when possible, they take advantage of these. Conversely, headwinds make flight more difficult, so they may land and wait for turbulent weather to pass before continuing. 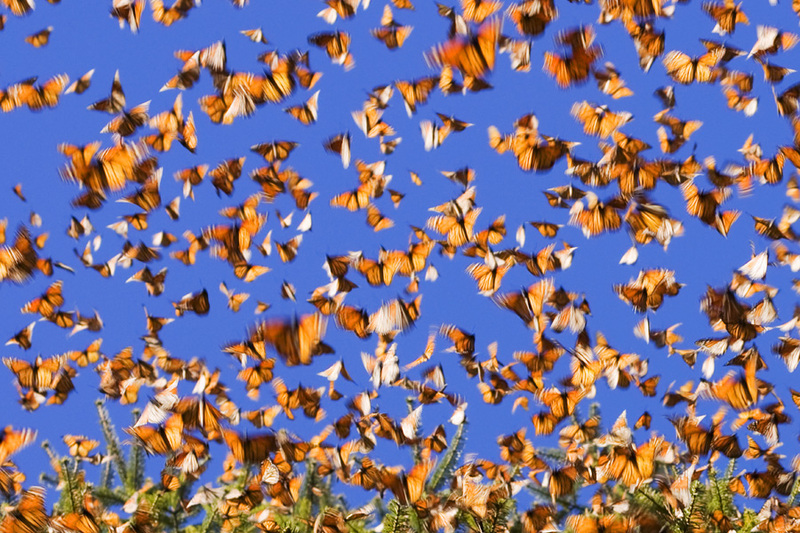 One of nature’s most impressive migrants is the brightly colored Monarch butterfly. On delicate wings of intense orange and black, they fly some 2,000 miles from southern Canada to forests in central Mexico, where they will overwinter. In spring, they will begin the journey back, but they only take the first leg of the trip, settling to feed and lay eggs upon their host plants. As the eggs hatch and the pupae then turn to adults, the journey continues, with host plants readying themselves along the way. It takes several generations and legs of the trip for Monarchs to make it all the way back to southern Canada. 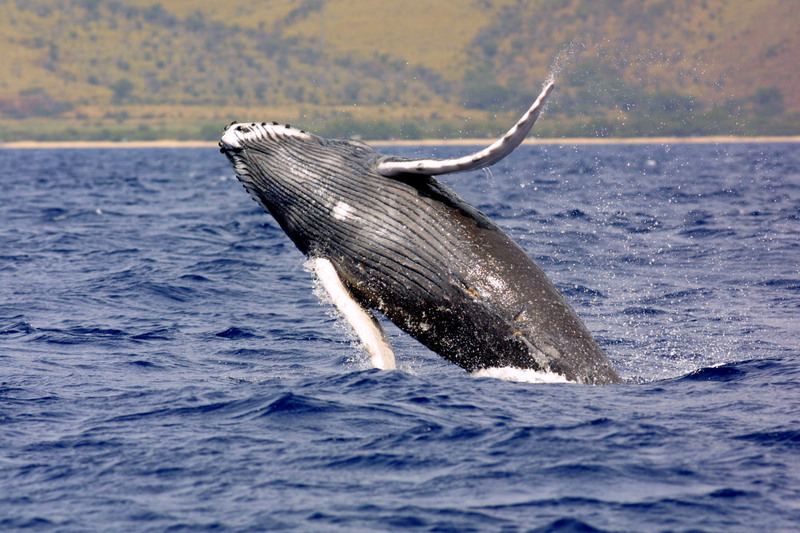 Humpback whales migrate thousands of miles each year between their feeding and breeding sites. At the other end of the size spectrum for champion migrating animals are whales. 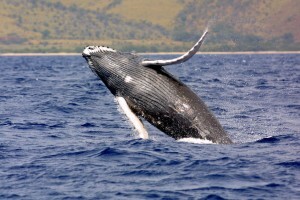 In 2010, the award for longest migration by a mammal went to a female humpback whale who traveled from her breeding ground in Brazil to one off the east coast of Madagascar, 6090 miles away, nearly twice the average for her species. In April of 2015, scientists reported an even longer whale migration, though, undertaken in 2011, by a nine-year-old female gray whale, named Varvara. She belongs to a group of whales off the Russian coast known as the western north Pacific gray whale population. These whales were thought to be isolated from their counterparts in the eastern Pacific, but Varvara migrated from Sakhalin Island, Russia, and joined with a group of eastern Pacific gray whales to make her way to Cabo San Lucas, Baja California. Gray whales’ typically travel an impressive 12,500 miles each year, but Varvara’s itinerary to Baja California and back raises the bar even higher… she journeyed some 14,000 miles! To all whose hearts reside in the bird camp, fear not. The award for longest migration of all still goes to a bird. The Arctic Tern makes a round trip that is nearly a complete circle of the planet. These beautiful and aerodynamically refined birds fly from their Arctic breeding grounds of open tundra, boreal forest, or rocky islands and beaches to wintering grounds on the edges of pack ice off of Antarctica, a journey of well over 40,000 miles. 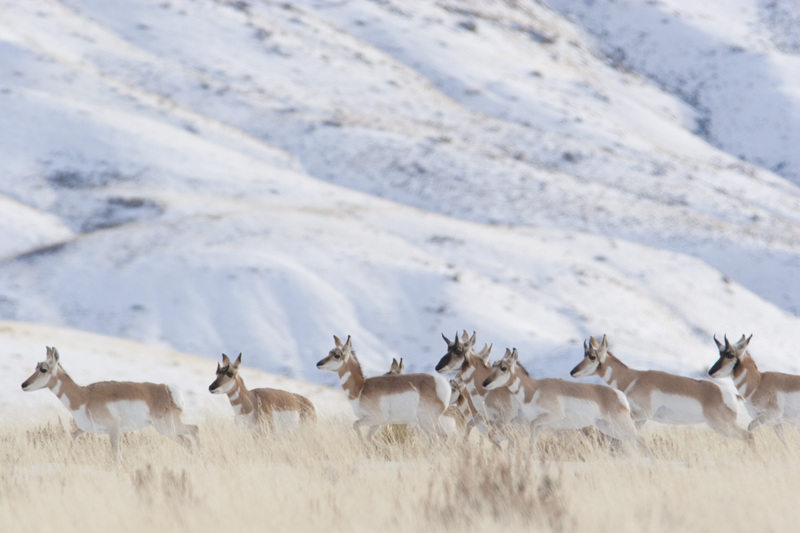 Other animals such as caribou, elk, moose, and pronghorn migrate to avoid deep snows that would cover the grasses on which they forage. There are bats that migrate. Salmon migrate from the ocean up freshwater rivers, returning to where they hatched to spawn. While frogs do hibernate, they first must migrate from shallow summer ponds in which they breed to deeper lakes where they settle into the mud on the bottom to overwinter. Animals continue to evolve and refine their behavioral strategies for coping with fluctuations in weather and food availability, even as they continue to adapt their physical features for better coping with the risky business of migrating. Take some time to learn about animals from your area that interest you most—you might be amazed at their feats and highly evolved features! Among the hazards that add to the challenges of migration are habitat loss, pesticides, extreme weather conditions, predators, diminishing natural foods, cell phone towers, excessively lit tall buildings (a collision hazard for birds), and a lack of safe places for rest stops. You can help migratory birds and other migrating creatures by protecting natural habitat in your area and by creating wildlife habitat in your own backyard.